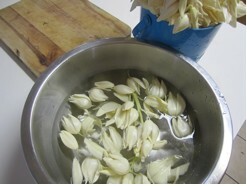 Eat the ivory-white flowers raw or cooked, but be sure to pluck out the central stamen and pistils since they can be bitter. Some yucca species produce palatable fruit that can be eaten raw or cooked. The flowering stalks of the menacing daggers erect themselves in the spring to tempt their pollinators and impress with their display. Though brief and fleeting, the beautiful white blooming flowers are a unique, crunchy texture and nutty taste for our tables. Many different yucca species grow in Texas and all have edible flowers and fruit. Of course we call some plants yuccas that aren’t true yuccas (such as the red yucca - Hesperaloe parvifolia) so be sure you’re indulging in the right kind of flower. Some yuccas are considered trees and others shrubs. Whether their fibrous, dagger-like leaves are high in the sky or low to the ground, you’ll have to figure out a way to trim past them to harvest the tropical-looking treat. Simply bend them aside or snip off the sharp tips with pruners or clippers, and pluck the flowers off the central stalk. Take care of your precious eyes! Once harvested, the yucca flowers should be soaked in water for several minutes to drown out any bugs tucked inside the petals. Once washed, pluck the central stamen and pistils and eat the crunchy, outer petals raw or cooked. The whole flowers are gorgeous stuffed with anything sweet or savory. The flowers will keep in the vegetable crisper for a few days, though they tend to turn bitter.